Probabilities can be thought of as measures of uncertainty in the occurrence of an event, the truth of a hypothesis, and so on. These measures are numbers between 0 and 1. 0 means the event is impossible to occur and 1 means the event is certain to occur. If you have many events of interest, you can measure their probabilities separately, but you can also measure probabilities of different combinations of these events. But what if you want to calculate the probability of both Arsenal and Barcelona becoming champions? Or the probability that at least one of the three teams does? In this post, I’m going to show how probabilities of such combinations of events are calculated. I’m going to give the general formulas, as well as the intuition behind them. To do that, I’m first going to introduce a few relevant concepts from probability theory. The most important concept is that of compound events. These are events formed by two or more “smaller” events, by requiring that either all or some of them occur. 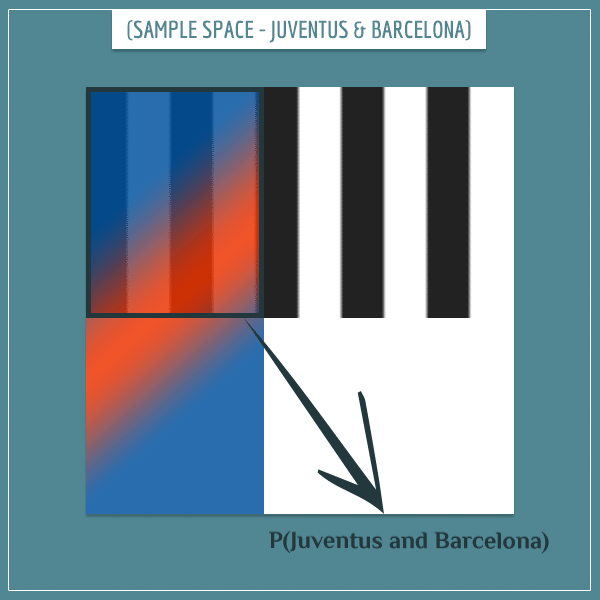 The event “Barcelona and Juventus” will occur only if both teams become champions in their respective national league. The official term for these kinds of probabilities is joint probabilities. 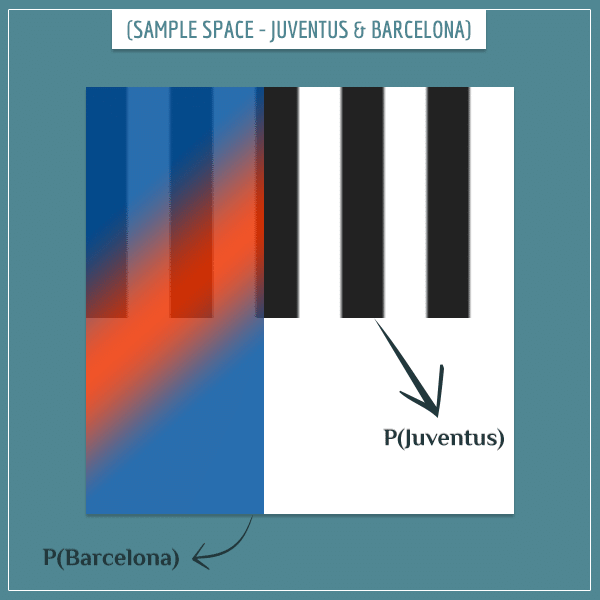 In this case, the event “Barcelona or Juventus” will occur if one or both teams become champions. In probability theory, the most common notation used for and relations is ∩ and for or relations it is ∪. These symbols come from set theory (where probability theory is ultimately defined) and represent the intersection and union operations on sets. With this notation, the first probability above would become P(Barcelona ∩ Juventus) and the second would become P(Barcelona ∪ Juventus). However, I’m only giving this notation so you know it exists and recognize it when you see it somewhere else. 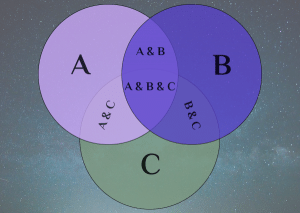 I’m not going to enter the territory of set theory in this post and, for readability purposes, I’m going to continue using the and/or notation. Life can be made easier by assuming the area of the sample space is equal to 1. In that case, the areas of the events will directly correspond to their probabilities. For simplicity, I’m going to make that assumption for the rest of this post. To continue the metaphor, an event occurs if a randomly picked point from the entire sample space happens to be in the rectangle representing the event. P(Barcelona and Real Madrid) = 0. This just captures the intuitive understanding that two teams can’t both become champions of the same league in the same year. 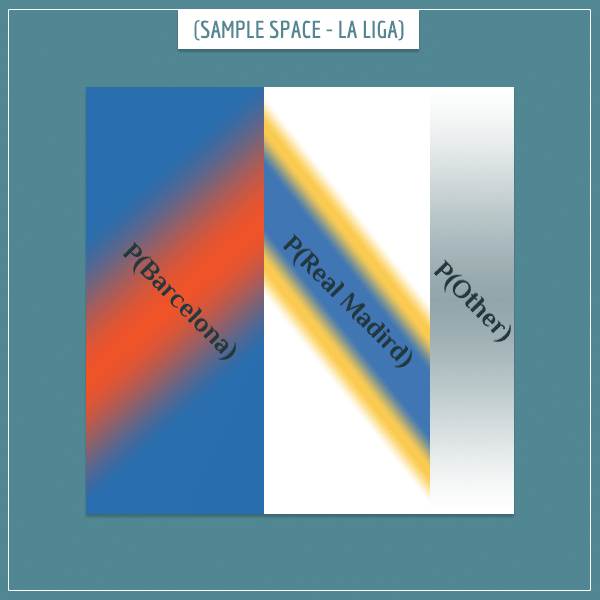 One of the two teams will become the Spanish champion if a randomly chosen point from the sample space happens to be inside one of the rectangles representing the two teams. So, the probability that the point will be in at least one of the rectangles is equal to the sum of the two areas. How is this probability actually calculated? In a previous post, I gave a detailed explanation for the answer to this question. So, I’m going to skip the steps here, but you can find them under the section called Joint probabilities and joint sample spaces. 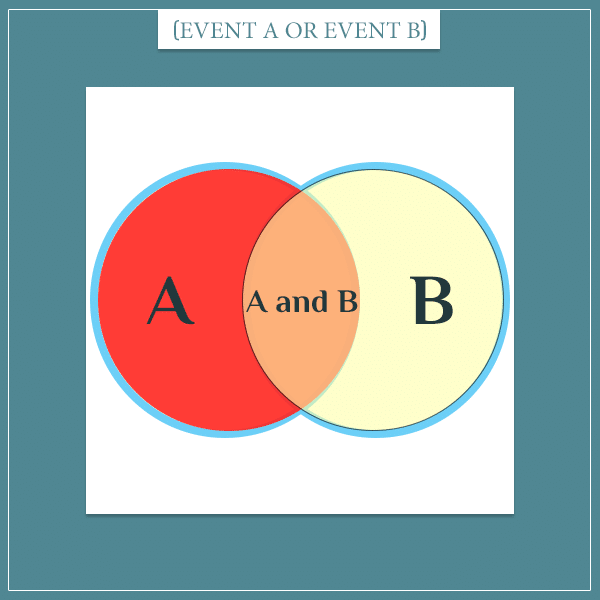 The term P(Event-2 | Event-1) is the conditional probability of Event-2, given Event-1. The last thing I want to briefly talk about before closing this section is the concept of dependence between two events. In general, any time knowing the probability of one event increases or decreases the probability of another event, the two events are dependent. Remember I said that the sense in which the term dependence is used here is different from the way in which it’s used generally. The reason is that in probability theory dependence between two events doesn’t imply any causal relationship between them (which is usually what people mean when they say “A depends on B”). In this section I’m going to give the general formulas for calculating probabilities of compound events formed by two or more simpler events. I’m starting with with a single event, and adding a new event at every line. Try to catch the pattern before looking at the explanation afterwards. Basically, you multiply all events, each conditioned on all previous events that have already been listed. P(A) is unconditional because it’s the first listed element. The order doesn’t matter for the general formula (the letter labels are arbitrary), but in practice some orders are more appropriate, based on the actual dependency structure between the events. Can you see why? Hint: what is P(B|A) if A and B are independent? Group the events into singles, pairs, triplets, quadruplets, and so on. Add or subtract all possible combinations of each grouping in ascending order, starting from addition and taking turns (among the two operations). In other words, you add all singles, then subtract all pairs, then add all triplets, then subtract all quadruplets, and so on, until you reach the largest group (all elements connected with and relations as a single event). The intuition here is the same as the one I gave when I first introduced overlapping events. Each term corrects for counting a particular area (corresponding to a joint probability) too many or too few times. And relations: all events in the compound event occur. Or relations: at least one of the events in the compound event occurs. Non-overlapping events: a set of events of which only one can occur (aka, mutually exclusive events). Overlapping events: a set of events which can all occur simultaneously (mutually non-exclusive events). Independent events: a set of events where having information about one event doesn’t change the probabilities of the others. Dependent events: a set of events where having information about one event increases or decreases the probability of the others. When building probabilistic models — or really doing almost anything related to probability — it’s impossible to get away with not working with compound events. So, understanding the concepts I introduced in this post is an important stepping stone for understanding more complicated concepts in probability theory and its related fields. If you want to read about a specific application of compound event probabilities, check out my Bayesian belief networks post. Bayesian belief networks are a useful tool for propagating probabilistic information between sets of events which probabilistically depend on each other. Amazing. I was still bound to the idea that a dependent event was simply an overlapping event.